In this stick welding arc welding video, the amperage used was not exactly optimal. I used 85 amps for the 1/8” 6010 and 3/32 7018…that’s trick I learned years ago when I carried a leather rod pouch on my belt and was 100 yards from the welding machine. I set the amperage to around 85-90 amps and carried 1/8” 6010 and 3/32 7018. Socket welds could be welded with the 7018 and root passes could be welded with the 6010. I left the amperage on 85 for the 1/8” 6013…that was way too cold. The bead looked ok but often when you run 6013 rods too cold, you wind up with a tunnel of slag down the middle of the bead with hardly any weld metal joined together. I used 120 amps for the 5/32 6011 and for the 1/8” 7024.It was just a tiny bit cold for the 6011 but way too cold for the 7024. Here is a shielded metal arc welding rod chart…an amperage chart for stick welding rods and what happened definitely correlates with the optimum suggested amperage for each rod used. 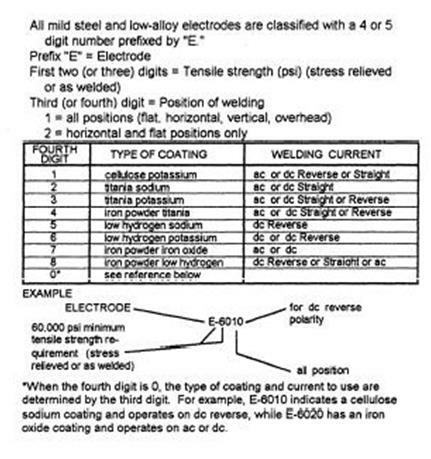 Several people emailed after seeing the last welding video about different types of welding and asked for a breakdown on shielded metal arc...stick welding electrodes and what in the heck those numbers mean printed on the stick rods. …you know, the AWS stick electrode numbering system. Some of them also asked for an explanation on where to use the different shielded metal arc welding rods also known as stick welding rods. As far as mild steel stick welding rods go, there are only a few that are widely used. 7018 stick welding electrode is used for pipe welding and structural steel welding and a all kinds of repair welding. If you want to know more than the quick down and dirty summary on stick welding electrodes, then read on. First of all , lets get some terminology straight. In welding, there are lots of different names for the same thing…you know like, heliarc, vs TIG, vs, Tungsten Inert Gas, vs Gas Tungsten Arc Welding…but it’s all the same thing. It’s the same with stick welding. Shielded Metal Arc Welding or SMAW for short is what the AWS would like us to call it…I wonder how that is working out.In parts of Europe its referred to as MMA or manual metal arc welding. And I am sure they have some slang terms as well. No matter what you call it, stick welding is a basic old school welding process that has stood the test of time. Its down and dirty…and I like it. Even though mig and flux core welding are much faster for production welding, they have not replaced stick welding for portability, simplicity, and reliability. 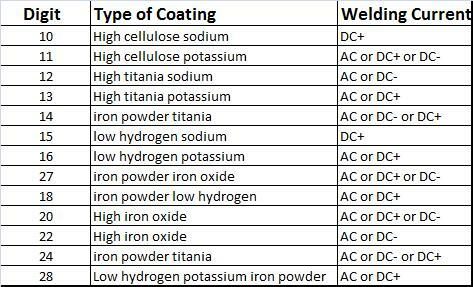 So lets launch into what the numbers mean that are used to identify a stick welding electrode. Using E6010 for an example.. The E indicates Electrode because remember, some welding rods are not electrodes. Tig welding rods for instance are usually not used as an electrode but are usually labeled with a ER for electrode or rod because they could be used for either…I don’t see it, but that’s the idea. The 60 in 6010 indicates the tensile strength in psi. so in theory, if you had one square inch of weld metal in a slow straight pull, it wouldn’t fail until you applied 60,000 lbs. The last 2 digits indicate position and polarity along with what type flux. See the chart below. An important tip to remember is that the second to the last digit in E6010 indicates the positions that that rod can be use. A “1” means that it is an all position rod. A “2” means only flat and horizontal..thats why E7024 rods will attack you with molten blobs if you try to use them overhead. There is way too much information to memorize here. ..Way to complicated to remember all them so here is a chart to come back to. The good news is that there are only a few commonly used mild steel stick electrodes. E6011very similar to a E6010 but will run well on AC…This electrode is used for all-position AC welding or for welding on rusty, dirty, less-than-new metal. E6013This is an all-position, AC or DCEP electrode used by farmers for years. It makes a smooth bead but does not dig through rust or paint. …for welding clean, new sheet metal. E7024Typically used to make a large weld with AC or DCEP in plate that is at least ¼" thick, This rod is only for flat and horizontal welding…forget about using it for overhead or vertical up. #1 you are about to take a welding test for a coal fire power plant in Muscle Shoals Alabama. The test is a 6 inch schedule 80 pipe in 6g . The bevel angle is 37.5 degrees, the gap is 1/8” with a 1/8” land, the root pass is uphill 6010 and you are permitted to run a hot pass with 6010 also to burn out any slag or wagon tracks left by the root pass. You set the machine to DCEP at about 85-90 amps. #2 You get some free heavy duty angle iron that is ½ thick by about 3 inch legs. But it has a light rust coating on it. You want to build a rack to hold lengths of metal like bar stock, angle iron, channel iron and pipe. But all you have is a Lincoln 225 ac buzz box. Get some 5/32 6011 and weld like hell. It will burn right thru the light rust and give you a strong weld that is bigger than you could get with a 1/8” rod. #3 Your brother in law wants you to help him weld a fender patch in his 92 nissan maxima.You don’t have a 115 volt mig welder but you do have a small stick welding machine. To get him and your wife off your back , order some tiny little 1/16” 6013 stick rods from northern tool and weld his patch downhill. #4 you need to build a trailer but you don’t have a shop. The welds need to be strong and look good too. You will be welding outside and the wind might be blowing. 7018 is the ticket. In the hands of a good welder, the slag will roll off with no problem, the welds will be strong as well as smooth.